The so-called Hadrian’s Temple is one of the most famous monuments in the ancient city of Ephesus and occupies a prominent location in the western section of Curetes Street, one of the chief thoroughfares of the site. Although it was discovered in 1956, this building has never been systematically analyzed, studied, or published. As a result, it has remained a subject of controversy for over half a century. Both its function as a temple and the homogeneity of the structure have been questioned repeatedly. The different colors represent the different types of marbles used in the architecture. Extensive analytical work on the provenance of the marbles of the architecture showed that only local Ephesian marble was used. One group of samples is still not assigned to a source. The scattered distribution of the different types of marbles does not show any systematics. This indicates that the Hadrian’s Temple was built with spolia from one or different precursor constructions. Isotope diagram of the marbles of the Hadrian’s Temple. 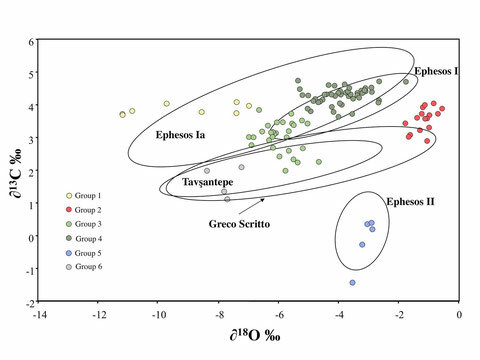 The origin of the group 2 samples (red data points) is not yet verified.